Today's So Shoe Me is the Pyro Platform Heel by Unif, $198, available at Urban Outfitters. 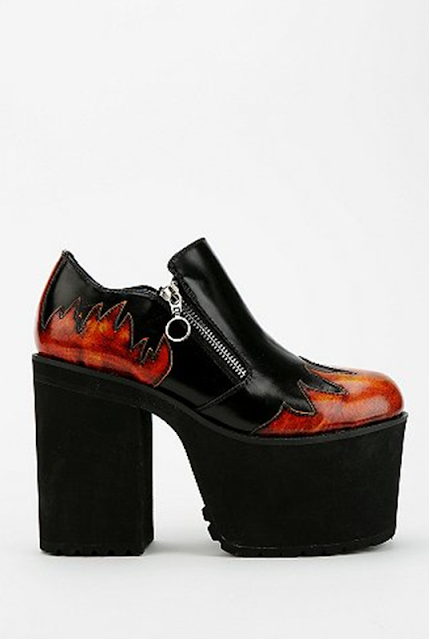 Set your sole on fire in these flame fetish platforms by Unif. A clunky chunky heel and platform add an extra edge to these 90s shaped shoes. A heavy dose of red hot style is added with ombre leather accents in a trippy flame pattern making these shoes perfect for adding an edge to punky pieces or everyday essentials. Pair these fiery booties with a grunge inspired plaid maxi dress and a metal embellished moto jacket for the perfect house party gear. So Shoe Me a pair of hellish heels that will fire start my fall fashion with the perfect chunky boot.